Test kit for the specific detection of living Alicyclobacillus spp. as well as Alicyclobacillus acidoterrestris cells in fruit juices, fruit concentrates and similar samples after short pre-enrichment. 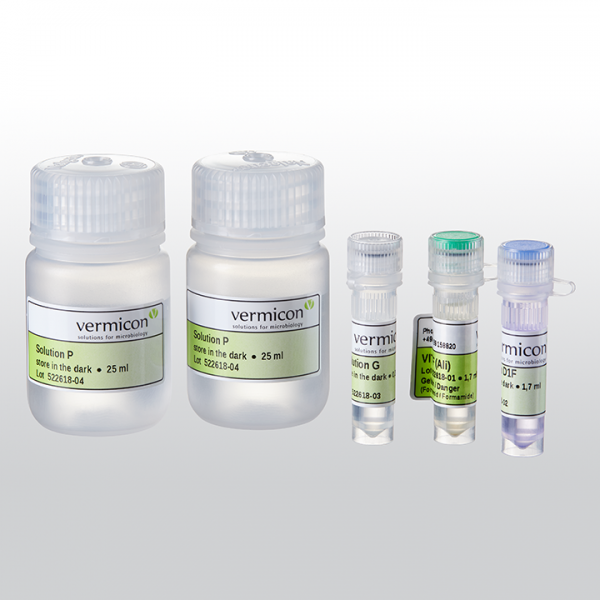 The specifically programmed VIT® (VIT® = vermicon identification technology) gene probes bind to target structures within the corresponding living bacteria in the fruit sample material and deliver maximum specificity and speed for the detection. The reagent has been specifically adapted for selected configurations of the flow cytometer CyFlow® Cube. Albania, Andorra, Armenia, Austria, Azerbaijan, Belarus, Cyprus, Croatia, Belgium, Bosnia and Herzegovina, Bulgaria, Czech Republic, Denmark, Estonia, Finland, France, Georgia, Germany, Gibraltar, Greece, Hungary, Iceland, Republic of Ireland, Israel, Italy, Kazakhstan, Kosovo, Latvia, Liechtenstein, Lithuania, Luxemburg, Macedonia, Malta, Moldova, Monaco, Montenegro, The Netherlands, Norway, Poland, Portugal, Romania, Russia, San Marino, Serbia, Slovakia, Sweden, Switzerland, Slovenia, Spain, Turkey, Ukraine, United Kingdom, Uzbekistan, Vatican City State. Algeria, Bahrain, Egypt, Iran, Iraq, Jordan, Kuwait, Lebanon, Libya, Morocco, Oman, Palestine, Qatar, Saudi Arabia, Sudan, Syria, Tunisia, United Arab Emirates, Yemen. Angola, Benin, Botswana, Burkina Faso, Burundi, Cameroon, Cape Verde, Central African Republic, Canary Islands, Chad, Comoros, Cote d'lvoire, Democratic Republic of the Congo, Republic of the Congo, Djibouti, Equatorial Guinea, Eritrea, Ethiopia, Gabon, Gambia, Ghana, Guinea, Guinea Bissau, Kenya, Lesotho, Liberia, Madagascar, Madeira, Malawi, Mali, Mauritania, Mauritius, Mozambique, Namibia, Niger, Nigeria, Rwanda, Sao Tome and Principe, Senegal, Seychelles, Sierra Leone, Somalia, South Africa, South Sudan, Sudan, Swaziland, Tanzania, Togo, Uganda, Zambia, Zimbabwe.